wow. since my last post a few days ago, my email, facebook, twitter, cell phone, etc. have all been blowing up! thank you guys SO MUCH. i have been really amazed by how many of you actually took the time to read that ginormous post...not to mention the millions of you who have written to say how touched you were by our story. it's odd for me to say "our story," because it is still as surreal as ever. out of this entire experience, i think my biggest fear was not knowing what type of reaction to expect from friends or others outside of the situation. everyone always has their own opinions about everything...including things they know nothing about...and they're never shy to express them. i was terrified that people would misinterpret my decisions as "forsaking my american family" or some other bogus idea...when nothing could be further from the truth. and i was afraid that my american family would be stuck fielding all of the questions and end up really discouraged. miraculously, my fears were unfounded as we've had nothing but positive feedback and encouragement. i can't tell you what joy that brings to my heart. i truly, truly appreciate you and how you have responded to our situation. your reactions have only taken an awesome experience and made it a million times better. 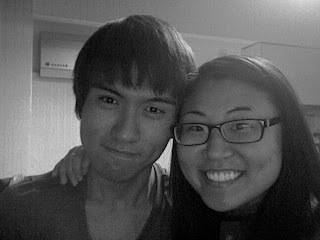 little brother hyun-bae is only here in korea for a little while longer before he has to return to china for school. so last night, we met up for dinner and he stayed in my spare bedroom here in cheonan. over dinner, he told me that there had been a family meeting and they decided that i needed a new korean name...a different one from what was given to me at birth. though that name was given by my now-deceased paternal grandfather, they all agreed that it was too antiquated and i needed something that suited me better. they took a vote and dubbed me 현아...romanized as "hyun-ah." coincidentally enough, it's pretty similar to hyun-bae, isn't it? :) so i will now be known as 현아 to my korean family. hyun-bae also got to meet my american parents via skype last night. they hit it off immediately, and can't wait to visit in person. 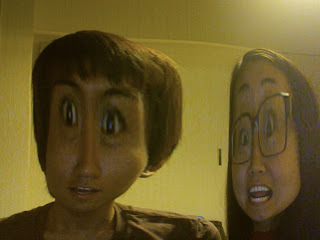 appropriately, we ended the evening with some quality photobooth time. i'm a proud noona. tomorrow, i will head back up north to seoul to spend the weekend at my family's house again. it sounds like they have pretty much got me booked up between shopping trips, meals, and meeting appa's side of the family. forgive me if i totally fall off the radar next week, but i feel like some serious sleep will be in order by the time i get back home to cheonan on sunday night. a quick story to end this blog. i think it is the perfect representation of how my two worlds have collided. last sunday, omma and appa loaded up the entire family in the car to drive me back to my apt in cheonan. when we arrived, omma instantly started opening all of the drawers and cabinets to see what i had and make sure i was living well. when she opened the refrigerator, she gasped. i couldn't figure out what was wrong...i knew that i hadn't left it empty. then in korean, she said "WHERE IS THE KIMCHI?!" bahahaha. of course! she was legitimately distraught about the situation and i kept telling her it was really ok. i didn't need to keep kimchi in my house because i ate it everyday for lunch at school. she said "well what do you eat for breakfast and dinner?" as if that is the only thing in the world there is to possibly eat for breakfast or dinner. it took my brother and i a few minutes to calm her down...and i still expect her to ship me home this weekend with a 10-gallon bucket of fresh cabbage kimchi. that's all for now. i'm sure i'll have plenty more stories to tell after the weekend. THANK YOU all again for your love and support. i have been really touched by reading the ecstatic comments you've left on my facebook wall or watching you literally shed tears of joy for me and my families. i am absolutely convinced that i am the luckiest girl in the world to not only have 2 amazing immediate families, but also wonderful friends & extended families, too. know that you are cherished.